The 55-lesson video course demonstrates how to use Adobe Photoshop to digitally restore damaged and aging film photos and quickly correct color issues in digital shots. Software training firm InfiniteSkills Inc. has introduced a Photoshop tutorial focused on teaching how to restore damaged, aging and incorrectly shot images using the many tools and features the Adobe program makes available. The Photo Restoration course provides five hours of tips that home and professional photographers as well as scrapbookers can use to make previously impossible image enhancements and repairs. The hands-on course is narrated by veteran software trainer Andy Anderson, who narrows the focus of the tutorials to specific skills that are overlooked in more general Photoshop primers. InfiniteSkills content coordinator Chris Johns expects that home users, scrapbook hobbyists and even photo professionals will be able to quickly integrate the lessons into their own projects. "These are practical, hands-on skills that make a real difference in photos that may have previously been lost to time," Johns says. "The training goes point by point through common issues and solutions, using Photoshop's tools to radically improve images with professional yet learnable techniques." 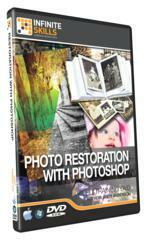 The 55-lesson Photo Restoration tutorial first covers Photoshop basics--workspace, scanning, and color settings--before diving into common problems faced by anyone who has worked with collections of older photos. Creases, scratches, tears and stains are introduced and handled one by one onscreen, using proven techniques that eliminate signs of damage and age. Instructor Anderson also goes into techniques and considerations for getting better scans, including minimizing noise, straightening images, and using basic settings to clean them up. The course also includes a helpful section on adjusting exposure and colors, which can be done to digital photos just as easily as those shot on film. "These tutorials tackle photo problems that almost anyone can relate to," said Colin Boyd, sales director for InfiniteSkills. "Andy shows how to bring damaged pictures to life, whether it's a favorite childhood portrait or a special photo that has been passed down." Andy Anderson is a one-of-a-kind technology trainer with decades of experience working in both digital and analog photography and as a professional author and teacher. He is a recognized expert in the industry of digital imaging technology, and he has conducted numerous software training seminars for Fortune 500 companies as well as the U.S. Government. In addition to this latest tutorial, Andy has served as a tutor for 12 other multimedia-focused video courses by InfiniteSkills. The InfiniteSkills Photo Restoration with Photoshop Training Video - Tutorial retails at a price of $99.95 and can be purchased on DVD-ROM or downloaded directly from the InfiniteSkills website. All InfiniteSkills tutorials are compatible with both Macintosh and Windows operating systems, and shipping and ordering options are available for customers worldwide. A selection of free demos from taken from the Photoshop training course is available along with a full list of contents and other information on the company's website. A leader in the field of technology software training, InfiniteSkills offers its signature experience-based model for teaching complex technology concepts, designing courses to help users integrate new skills seamlessly into professional and creative workflows. InfiniteSkills delivers video training to customers anywhere they want to learn. Titles are available as DVDs, digital downloads, or in new mobile editions.